Excelsior JET is a certified Java SE 6 implementation powered by ahead-of-time (AOT) compilation technology, which helps you: * Speed up your Java applications without any source code changes or hardware upgrades * Protect your Java code from decompilation without compromising its performance * Build compact, professional installers for your Java applications without dependency on the JRE * Create pre-installed Java applications and save a fair bit of space when storing them on flash media such as USB drives Excelsior JET Optimizer works by converting your application's classes and jars into highly optimized Intel x86 code and creating a native executable for Microsoft Windows or Linux platform. 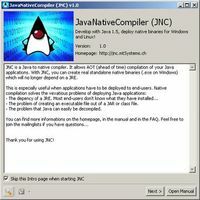 The executable is linked with Excelsior JET Runtime, a complete implementation of the Java SE 6 platform. Finally, Excelsior JET Installation Toolkit facilitates rapid creation of complete installation packages for your optimized Java applications. 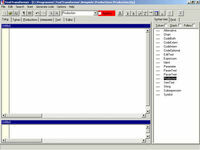 Excelsior JET is certified Java Compatible on a number of Microsoft Windows and Linux (IA-32) platforms. Version 7.2 adds the Startup Accelerator and reduces build time.